JANCKER wrote: We should be able to win vs Darmstadt without a manager... so just cut the crap. All our players earn 4 or more times than Darmstadt players, they didn't show why today. 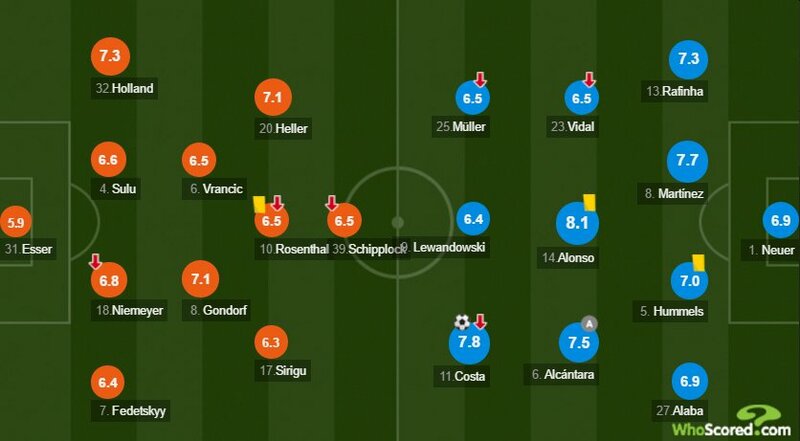 People should stop looking at WhoScored.com ratings. You know they're bad when you find out that Alonso is listed as the 5th best player at Bayern with an average rating of 7.39 while Kimmich is in 15th place with an average rating of 6.92. With his one metre passes he was ok. I saw him try hard + clean sheet... that's why I'm sparing him from criticism, giving him a break. Vidal was worst IMO. I saw him try hard + clean sheet... that's why I'm sparing him from criticism, giving him a break. The only positive thing about him playing the full matchch today is that most probably he will sit it out next Wed. It seems that Vidal tends to "ghost" in matches like these. He is the same since he came. Seems like he doesnt give himself too much against the lower table teams. Been the same with Pep... He steps up after February, i guess. Yes 3 points was important. and yes it is hard against bus parking team but the problem is we are allowing too many chances. They 3-4 very good chances to score. Better teams most likely don't miss those. rthebest wrote: Yes 3 points was important. and yes it is hard against bus parking team but the problem is we are allowing too many chances. They 3-4 very good chances to score. Better teams most likely don't miss those. True... but that's nothing new. We have to improve if we want the CL... all I care is that the next game remains very important and they have all what's needed to hurt us... hope we saved energy for that game. Last edited by JANCKER on Sun Dec 18, 2016 8:15 pm, edited 1 time in total. Funny that I wrote this about Vidal on 20.02.2016 and guess what - a game against Darmstadt. zozon wrote: I've always said that Vidal is a beast and always repeated myself that he will shine when he's needed the most/when the going gets tough - knockout phase in CL. Yes, he had a few games at Bayern when he was almost like a headless chicken, but I think that was his personal motivation/other problems at those games. Vidal in his mood, form, motivation and good health is one of the best holding midfielders in the world, up there with only Busquets. A full blown Vidal is way above Gundogan or any midfield transfer targets you guys are praying for. I bet that they are going to give Darmstadt's interim coach a 2 year contract for managing to lose against Bayern by a solitary goal. And then they sack him in the summer.